You are currently browsing the tag archive for the ‘chicken’ tag. This past week (01.17-01.22) was “Restaurant Week” where we are. Basically, a lot of the restaurants downtown (which are normally priced higher than a student’s budget) offer meals for a little cheaper than normal. A lot of places offer lunch for $12, and some places had a “2 for 1” deal. My friends and I went to “Blue Nile“, an Ethiopian restaurant that had the “2 for 1” deal. It was a competition between Seva’s, a vegetarian/vegan place, and Blue Nile, and honestly, I’m glad Blue Nile won out. On the 2-for-1 $12 menu, there were four items. My roommates, friend, and I ended up getting two different dishes, the ZilZil Wat and Yedoro Tibs, with different vegetable sides as well as a cup of spiced Ethiopian tea. Our tea arrived first. I think salads might just be one of the easiest college meals ever. All you have to do is wash and cut (or bake, depending on what you want), and it’s relatively healthy if your dressing is made with the proper ingredients. You can also adjust the flavor to fit what you need and want, so it’s nearly 100% customizable. In other words, make what you want and eat what you want, without the guilt that normally comes from doing either or both. My guilt-free meal came in the form of a large salad with fresh ingredients after a few hours of grocery shopping. It doesn’t make much sense to me when people are told not play with food. I mean, if what we food bloggers are doing isn’t considered “playing with food”, then what exactly are we doing? I mean, I’m turning 20 this year, and I still make noises (when no one’s looking or listening) when I’m trying to swallow a spoonful of mystery glop. The point is not that I’m extremely childish (although that may be the case), or that I’m actually a nutcase that can only be fed liquids (which is not so much, but also possibly, the case). The point is, playing with food actually makes the food more enjoyable, regardless of age. Kids love eating those mashed peas and beef when it comes zooming at them and “crash lands” in their teethless mouths. Adults would probably love a chocolate-sculpted airplane that could fly into their mouths and save them the effort of reaching into the chocolate jar. Which, sort of, leads me to these sweet potato boats I made one day. It’s amazing how few savory yam recipes exist out there. Thus, this is mostly my invention. It’s amazingly simple and is good enough when you need something simple and fairly healthy. This was actually made sometime last week, but I was so caught up with everything else that I’m only posting it now. 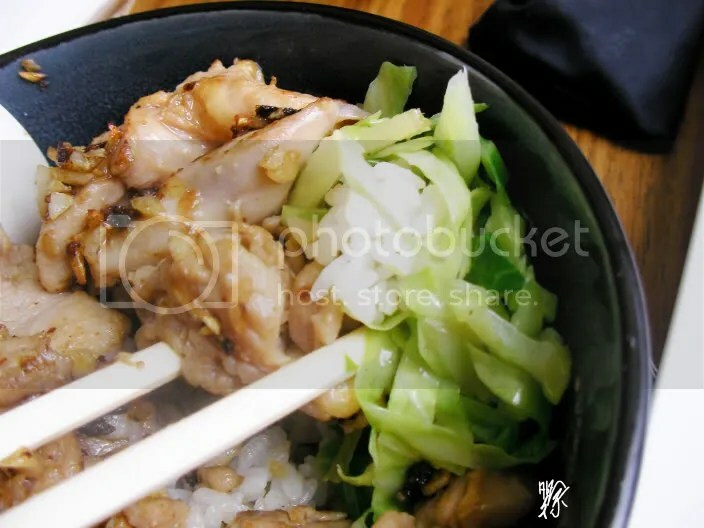 But besides that, who doesn’t love donburi? Katsudonburi, chicken donburi, beef donburi, donburi galore! It’s also a really good meal since it’s easy and quick and has the basic carbs, vegetables, and proteins (I think?). As usual, recipe and another picture behind the jump.